Sunday was fantastically relaxing! We were staying in the NSW hinterland for the long weekend. We ventured to the coast to spend time by the beach in the morning, and back to base for some time by the pool in the afternoon. :) We even got to watch the whales leaping in the ocean as we sat on the beach. Linking up with My Style Monday, Style Sessions, Trend Spin Linkup, What I wore Wednesday, Fashion Informant, Spotlight Weekly Linkup, Casual Friday today. 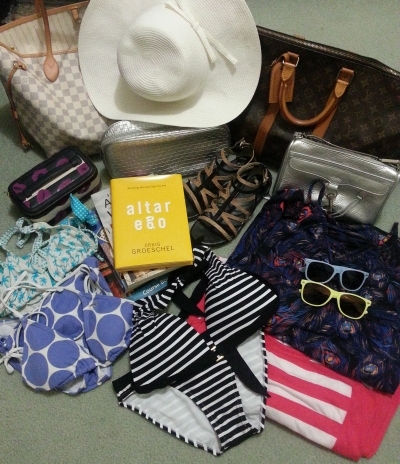 Last worn: sun hat, blue sunglasses, feather print maxi dress, Cotton On thongs, Louis Vuitton neverfull. Ripcurl, Roxy and Kiargo bikinis, the two maxi dresses I wore above, and 2 pairs of sunglasses. Last worn: sunhat (see above), yellow sunnies, pink stripe maxi dress, Cotton On thongs (see above), Louis Vuitton Neverfull (see above). Don't know what I love more....the print maxi or the beach in the background! I love the cool casual look, great for a beach day! 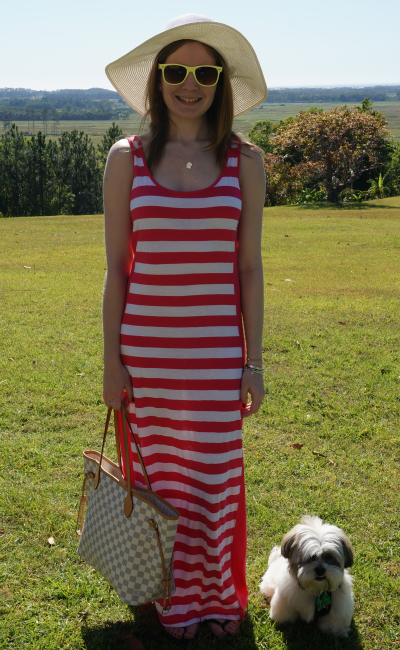 love that red striped maxi dress - so cute! Whales leaping from the ocean is breathtaking! You looked so pretty Mica! I love the dresses and hats you wore. Cooper looked like he had a great time too. That's so awesome. Wishing you an awesome week my friend. It was so good seeing the whales! Wish we had binoculars...or a zoom lens, haha! Oh, so fun! I am envious of your warm weather now! Love the long dresses. Loving the dress in the second picture. 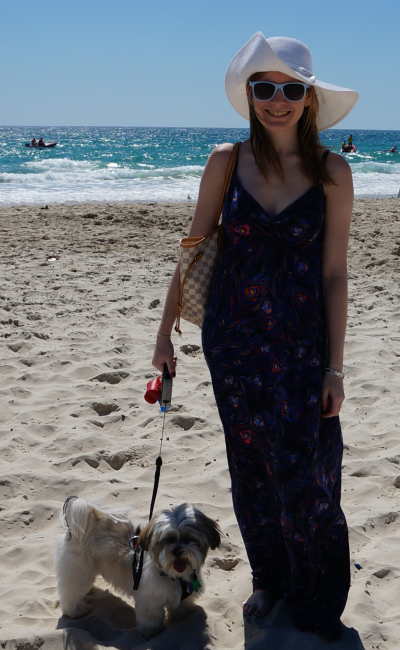 maxi dresses are perfect for the beach! love the inside look at what you packed. I love both of these maxi dresses, you look so cute in a hat! Ah you make me missing the sun and the beach so much! I am so glad to see you and DH (and Mister Cooper of course) had such a wonderful weekend getaway together! You look so cute in the big floppy hat and maxi dresses! It must have been so lovely to get away for the long weekend and spend some time at the beach. Great to see that Cooper was with you too. I'm so jealous, you got to see whales! :) must be nice to be having that summer feeling, I miss it already! looking wonderful with your hat and dresses, very chic :) Can I have your dog, too cute!! That floral maxi is gorgeous! And whale watching from the beach! Oh em gee! LOVE that pink stripe maxi dress!!! I love a good hat and you can never go wrong with a maxi! Love both maxi looks :) Looks like a fun mini vacay! Mica! I just got marc Jacobs mouse flats as a gift. They made me think of you and I'm so excited I just had to share it with you. Just saw your post! They are beautiful, what a lovely gift <3 Congrats! Those are lovely and comfy vacation looks! i love your maxi dresses! you look so relaxed and carefree! Gorgeous dresses...makes me wish it was summer again! You look great in these easy maxi dresses - easy and cas but put-together and chic all at the same time! yay for tropical getaways!!! :D love the maxi and hats together!! :D so fab!! Amazing dresses! You look lovely as always. I really like your cute dog. You have such awesome dresses! I love the red striped one. :) You're so gorgeous! Wow you took Cooper to the beach ! I havent taken my dogs there in a while. Your striped dress is beautiful and how amazing that you got to see whales. Cooper really likes the beach! He prefers the ones he can run around at, we had to keep him on the leash at this one sadly.